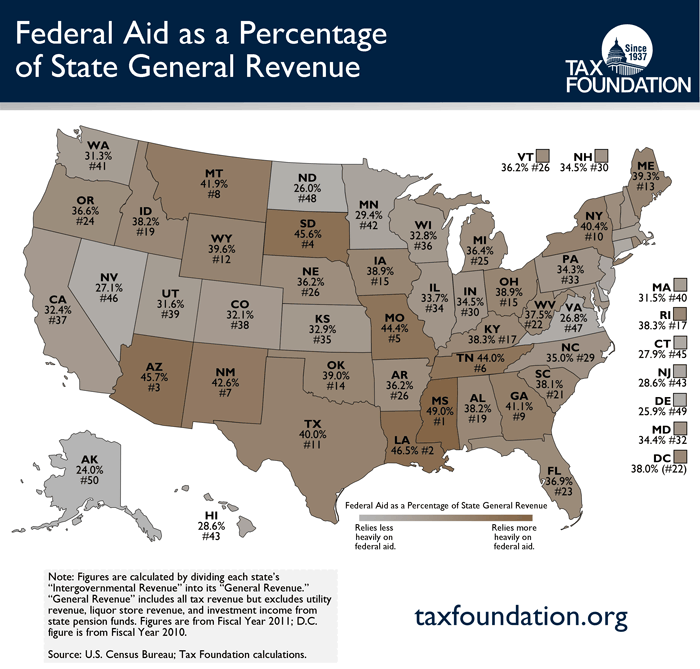 This week, our Monday Map illustrates what percentage of a state's general revenue is made up of federal aid. Mississippi relies more heavily on federal assistance than other states, with 49% of its total general revenue coming from federal aid. Close behind are Louisiana at 46.5% and Arizona at 45.7%. On the other end of the spectrum, Alaska relies on federal aid for only 24% of its general revenue, followed closely by Delaware at 25.9% and North Dakota at 26%. All maps and other graphics may be published an re-posted with credit to the Tax Foundation.